Having watched the price of photovoltaic solar panels steadily fall over the last few years and seeing a drop in incentives looming on the horizon, we decided to pull the trigger on a system for the Automated Home. We had visits from 3 local companies to quote for a 4kW PV system. That’s the largest single phase domestic installation you can connect to the grid in Northern Ireland currently. 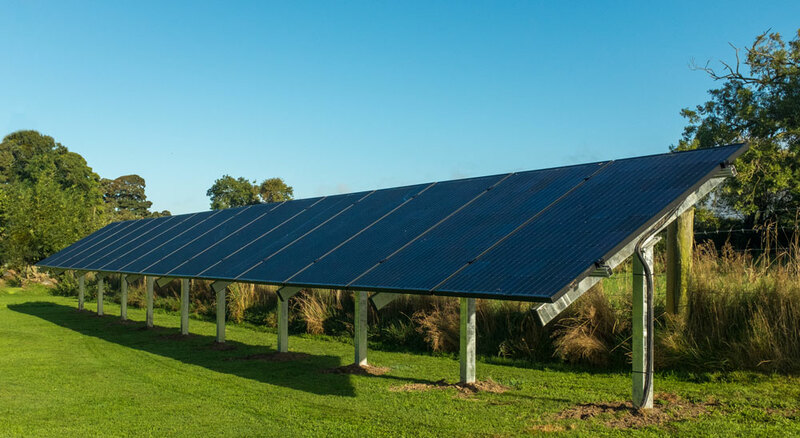 Two of the companies quoted a similar figure of around £5,000 whilst the third quoted for a more sophisticated system using micro-inverters at almost double that. We went with the Solar Panel Co NI, one of the companies around £5K after receiving a personal recommendation from a friend that had used them before. Our system comprises of 14 x 285W SolarWorld mono black panels and an SMA Sunny Boy 3600TL-21 inverter. Whilst we could have mounted some panels on the south-facing roof at the front of the Automated Home they wouldn’t have looked great and we have plenty of space so we opted for a ground mounted system in the back garden instead. Our rear fence runs around 25 degrees off perfect South meaning the parallel array faces SSE. A slightly westerly facing array is usually better than an easterly one as that means you continue to generate a little more power in the evenings when you normally use the most. But it should make very little practical difference. 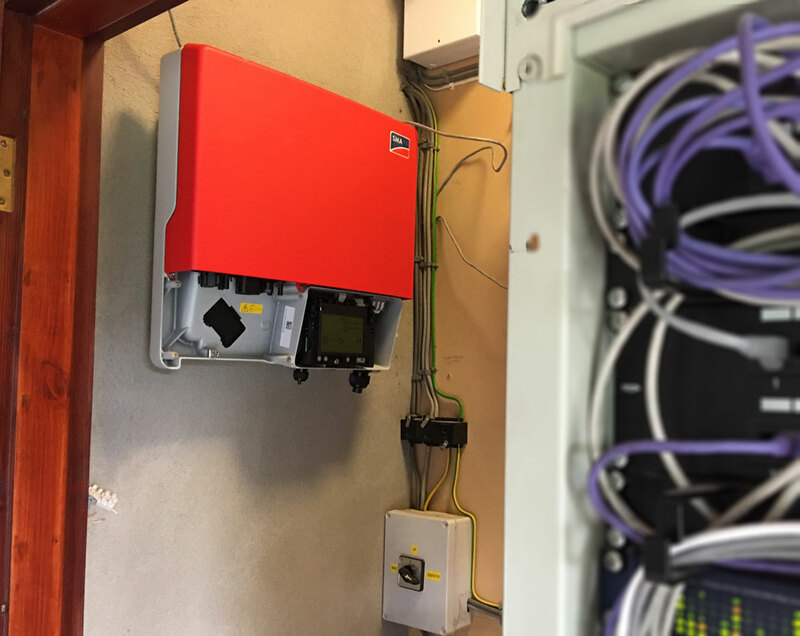 The guys from the Solar Panel Co NI did a fantastic job, installing the ground mount in the garden, erecting the panels, burying the cables that run into Node Zero and connecting everything to the SMA Inverter – all in one day. For now checkout the video of the system below and make sure to watch to the end for the obligatory time lapse of the whole day. 17 Comments on "Going Solar Part 1 – Installing a 4kW PV Array at the Automated Home"
Bravo looking forward to part 2. The ‘Immersun’ unit used to be a good addition to a PV system but I heard they had ceased trading … I wonder if anyone is making a similar system that allocates surplus power to the immersion heater rather than selling it cheaply to the grid. Thanks Patrick. We’ve installed a ‘Solar iBoost+’ which we’ll cover in another video. Thanks Paul – love to see pics of your setup. I’ll checkout open energy monitor, thanks for the tip. Congratulations and welcome to the #PV club. Your interest in weather, when the washing machine and dishwasher go on, chasing down your base load, the need to regularly check your generation stats, checking your Solar iBoost divert figures, reading about battery storage, exploring air source heat pumps and other traits of ownership will send the rest of the household crazy, but you can justify it! The guys at http://www.solarpanelni.com/ were a pleasure to deal with and did a very tidy install. I opted for 14 of the SolarWorld 285w panels and they are very unobtrusive on our black tiles. I’ve used the SolarWorld SunnyPortal to setup the predicted average yield expectations and year to date I’m on track to meet them. The Solar iBoost has given us plenty of piping hot water which in turn kept our wood pellet boiler off, so reducing those fuel costs and wear and tear on the boiler. All in a good decision and it provides hour of fun and entertainment, if you like that sort of thing! @Mark – you are right on the above 🙂 Thanks for all your help and recommendation! M.
@Mike – Thanks, big backlog in getting export metres fitted over here and talk that we’ll just get given a percentage of total generation instead (45%?). The guys fitted a small separate consumer unit with RCD and isolator switch. looks very neat – any chance of installed dimensions ? @Chris – the panels are a metre wide so 14m in length. If you need the height width I can get them for you? Did the video miss something, or did they really bury a cable carrying up to 40amps in a trench about 10cm deep? @MichaelID – It’s about 10″ deep and in an armoured flexible conduit. 40A is quite a lot – wonder if, on sunny winter days, a line in the frost will appear … like crop marks, from the air ? ! Congratulations on green energy. Its a great feeling that you / we are not using the finite carbon or giving cash to the energy suppliers. You have now tied in your energy costs at todays rate for 20 years and it will continue long after. I had a 4kw install just over a year. 2kw east 2kw west. Not perfect and took a few years to sort. Its just popped 3003kwh in the first year way above the estimate of 2,500kw so well happy. 12 X 330w benq pv, trannergy 3600 inverter. I had an I boost but changed to immersun as its logging ability and 2nd channel for underfloor heating in kitchen when hot water tank is hot. I set the thermostat to 65oc for pv and 52 for gas. This is like a battery system forcing energy into hot water is always way hot and enough. had to play with timer settings. The underfloor set to 24 on pv so heats way above what I need but excess heat goes to rest of house especially spring autumn saving on gas or running the boiler. You can program it to do a lot of things. The immersun logging is a must in how you use the energy. My inverter tells me every 15 mins what i am producing but its the immersun every 10 seconds that tells me what i am using or diverting or giving to the grid/ excess that i could use. It still does this but until someone else picks up the great product I feel its soon wont. I am looking for a device that does pv generation, house use with 3 temp sensors, house, hotwater, outside, and gas meter use all logging to the web or pc. I used to spend £120 per month on gas and elec, now its £40 and my fit and export payments are over £460 so I am cost neutral. With £120 per month staying in the bank I will be getting the upfront cost back within 5 years. Sooner a I had cash back on recommendations. As the export and fit are index linked and energy linked the returns will increase as with any increase in energy. Well happy. I dont agree about the look, its the future, but yours is great if you have the ground as you can get the perfect angle. The last point is this my base use is around 300w/hr with a 4kw import. My cooker eats elec and I cook at 20:00 when its dark, No good generating 20kw during the day but you only use 6kw. As winter comes days shorten so getting even 300w/hrs gets hard. So my ideal would be to have a 4kw battery system for no more than £1,500 on economy 7 top up (seems mad but if you can gt 4p/kw during the winter get it and use in evening and save on the 12p/kw. PLUS a 600w wind turbine to top up during the winter and nights. Thanks Mark, great review start. Moving house soon PVs top of my list of to-dos along with new heating system and controls. Will be going thru other reviews as well over next few weeks. Congrats on going solar. I installed a 6.5 kwh system on my roof almost a year ago. Elon Musk’s company did it for me so I am hoping to get one of the powerwall batteries when the priced come down a bit. Solar is one of the truly “smart home” purchased you can make.